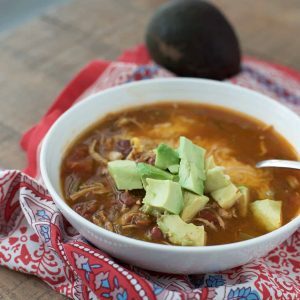 Enjoy a comforting bowl of Mexican Chicken Soup seasoned with chili, cumin and smoked paprika and filled with chicken, beans and vegetables. Warm flavors that hit the spot. Pour 4 cups low sodium chicken stock or water into Instant Pot. Add chili powder, cumin and smoked to paprika to liquid and stir. Add chicken, beans, diced tomatoes, celery, onion and pepper to chicken stock or water. Close the lid, turn knob to sealing and set to cook for 20 minutes. It will take Instant Pot about 20-25 minutes to come to pressure before countdown for cook time shows on display. Let cook for 20 minutes, then natural release for 15 – 20 minutes or quick release if you are ready to serve right away. Be careful to use tongs or a wooden spoon to turn knob to quick release to avoid getting burned from steam from pressure release. Remove lid and using two forks, carefully shred chicken in soup. Chicken should fall apart at the touch. Taste for salt and add if necessary. Serve with diced avocado and shredded cheese. Salt should be added to taste after soup is cooked. If using chicken broth you will most likely not need additional salt, but you may need salt if you used water. Depending on your ingredients (canned tomatoes and beans), there may be enough salt already in soup. Always taste test and adjust! Cutting the chicken into large pieces (instead of keeping as a whole breast) helps the chicken cook faster cutting back on cook time. I use the Instant Pot DUO 6qt in my kitchen.